There are 4 main parts for a mechanical clock or a mechanical watch. The brass gear is called Mainwheel. The long thin metal strip is called Mainspring. The amount of energy can be stored mostly depends on the elasticity (material, e.g. steel) and the effectinve length of the mainspring. Most watches have about 50 hours power and some expensive watches have 8 or more days power. The wheel train include gear 2, 3, 4. There are two functions for the wheel train. Transfer the power from the Mainwheel to the Balance Wheel. When the energy goes through the wheel train, the high torque form the Mainwheel will become the high speed oscillation at theBalance Wheel. Calculate the time according to the gear ratio between each wheel. Escape wheel, Pallet Fork, Balance Spring and Balance wheel form the ESCAPEMENT which controls the time of a clock. Balance Spring oscillates and Balance Wheel swings as a result they divide the time. Anchor and escape wheel control the power release according to the "divided time". There are different types of balance wheels, I will introduce them later. Show you the time ! 1 perod = the yellow dot goes from left to right and back to left. There are 4 main frequencies for the balance wheel in a watch. Pay attention to the two pins (red rectangles)on the Pallet Fork in the following movie. I put some pigments on the parts for movie recording only, the weight of the pigment will affect the frequency of the balance spring, as a result, affect the accuracy of the time. When the balance wheel swings, it will control the Pallet Fork to lock or release the escape wheel. Play back speed is reduced for easy viewing. 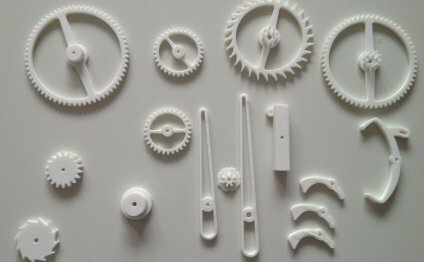 Because the gear ratio cannot be changed, the accuracy of a clock or a watch can only be adjusted by the frequency of the balance wheel. The frequency of the balance wheel can be changed by adjusting the effective length of the balance spring.